MyZones is an exciting new iPhone app from Yellow Field Technologies and Coach Joe Beer. It calculates training heart rate zones that can be used by runners, cyclists, triathletes from keen fitness enthusiasts to focussed racers. 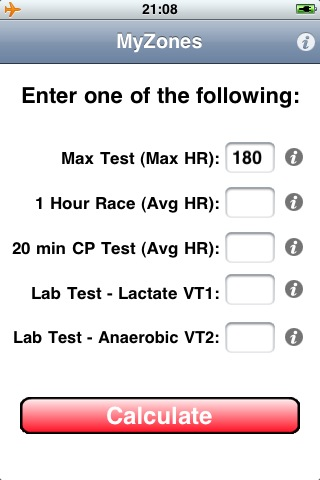 Unlike one-fits-all formulas MyZones can calculate your personal zones from maximum heart rate, race HR data, or professional lab test results. MyZones provides explanations of each training zone and the different methods you can use to calculate them. The training zones calculated can be used to set your heart rate monitor (e.g. Polar, Garmin or Suunto). It also allows you to enter the zones into training diaries such as iSMARTtrain. The accuracy and experience loaded into MyZones means you get to train and race with better results. Clear description of zones to optimise your training.